Where to take your herbivore friend! Whether you’re vegan, vegetarian or flexitarian, dining out can be difficult. Maybe it’s your friend who HAS to have bacon with their breakfast, or your mum who just can’t get her head around why you don’t eat dairy, (‘Just have a little bit! No one will know…’) but finding somewhere to eat to keep everyone happy, and not compromise your ideals, is not always a walk in the park. Luckily, we’re here to do the research for you, and for an office full of omnivores (except for that one weird vegetarian we hide in the corner), we were more than impressed by what Brisbane had to offer. Some people like to take the high road, but not these misfits. As famous for their political slogans as they are for their food, The Low Road is the café you never knew you needed – but now you can’t live without. With its eclectic décor, fun staff and a full vegetarian menu (most items can be made vegan) this is one road we don’t mind taking again and again. Try their famous beans, and wash it down with a brekky beer – it’s expected. One of the OG’s of the Brisbane vegan/vegetarian scene, Vege Rama has been feeding Brisbanites their veggies since 2009 when the first store opened on Queen Street. 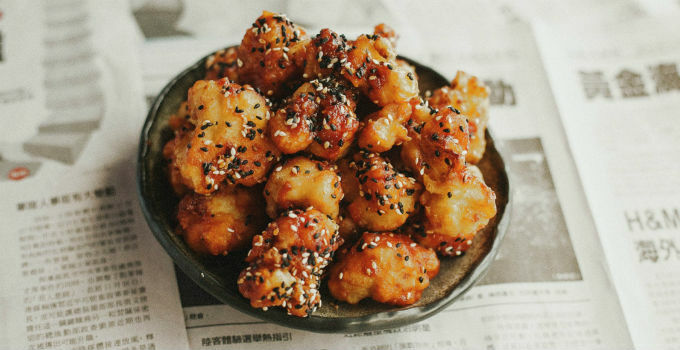 Keep it safe with classics like nachos and samosas or try their vegan spin on Kung Pao Chicken – Kung Pao Cauliflower. Believe us, you won’t even miss the meat. A Brisbane institution, it wouldn’t be a vegan list without mentioning this stand out. The Green Edge is 100% vegan and has a small supermarket attached to it with everything vegan under the sun. From dairy replacements to vegan pet food The Green Edge is your one stop vegan shop. The café also pumps out amazing food – the burgers being the stand out. We dare you to try the bacon double cheeseburger and see if you can taste the difference. Brisbane’s latest sensation is arcade/bar/diner/all-round fun place Netherworld. The brainchild from Scratch owner Ben Nichols, Netherworld is a gaming paradise with 25 arcade games for all your retro needs, but the real drawcard is the food. The menu is 100% vegan, with the option of adding dairy or meat, but believe us – even the most dedicated carnivores will be satisfied. Our pick? The Loaded Fries with pulled jackfruit and vegan cheese. Life. Changing. We’re known at G&G for our love of all things decadent. We’re not afraid of our pants not fitting if it means we can get our hands on something delicious, but at Miss Bliss you can have your cake and eat it too. West End’s health hub is bursting with vegan options from caramel spelt hot cakes with maca coconut yogurt and grilled banana to charcoal pizzas with roasted mushrooms and cashew cheese. Sip on a Kombucha Collins whilst you’re there – a delicious combination of Byron Kombucha and Botanical Distillery Gin. It’s a health tonic, right? The suburbs are where we find some of our best foodie havens, and Café O Mai is one of our favourites. Specialising in fresh Vietnamese food, Café O Mai loves everyone, and anything you can do, they can do – vegan. We can’t look past the ‘original gangster’ vegan pho pho chay for the ultimate hangover cure (sweat out that booze baby) or for those who need their carb fix, the tofu bahn mi is certified to hit the spot. While you go ham for leather on the suckling pig, vegos can order from over ten 100% animal-free dishes. They won’t even want to stop to judge you over the table while digging into Middle-Eastern inspired eats like braised lentils and rice with caramelized onion, and fried cauliflower with tahini, smoked almond and pomegranate. If you’re looking for a place to share some small plates, but Mr ‘doesn’t like the taste of meat’ over here can’t eat wings or sliders, make LONgTIME your go-to. You can go all out on fried tofu bao, damn son in law eggs with coconut cheese and eggplant yellow curry, and not even need the pulled pork. Indian fare is already pretty vego-friendly, but make it sugar and gluten-free and it’s just about perfect. Which is why It’s Mirchi is just the spot to order beef vindaloo while your veggie friends are umming and ahhing over the ridiculous amount of vegetarian options on this menu – including a vegetarian butter ‘chicken.’ Holy yum. With plenty on the menu marked with a V, vegos can be picky when choosing from Chop Chop Changs’ Asian street-food. From pumpkin yellow curry to stir-fried Schezuan eggplant, they’ll be too busy stuffing their faces to notices you’ve ordered your third serve of miso scallops. 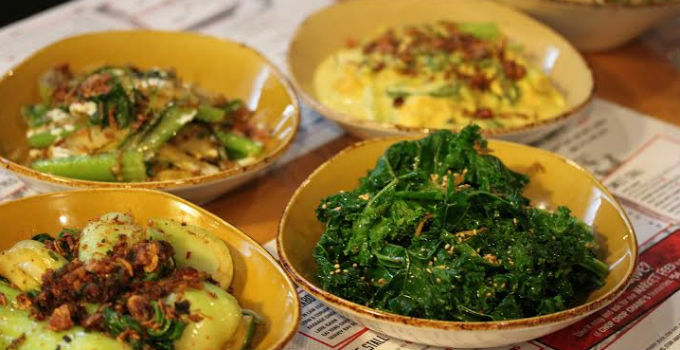 Serving up breakfast, lunch and dinner, you can rely on this Venzin Group powerhouse for some of the most healthy, tasty and of course, vegetarian friendly meals on the south side. With a zesty Asian menu that features vegetarian spring rolls, pad Thai and vegetarian options on a few other items, you can be sure there’ll be a dish for everyone. Who says vegetarians have to miss out on dinner with a view? Madame Wu matches their Story Bridge views with pumpkin rice noodle rolls, green tea noodle salads and stir-fried mushrooms and tofu. Words for the wise: order the chocolate bun with green tea ice cream. Chocolate doesn’t discriminate. If you’re hungrier for more than just one dish, or looking to indulge in the most decadent way possible, a degustation is the answer. Deer Duck Bistro, Urbane and Bacchus dish up an epic vegetarian degustation that will appease the pickiest vegetarian while you stuff yourself with endless courses of carnivorous delights. - that weird vegetarian in the corner.